I find it nearly impossible to actually use my Nutella. I think I've mentioned this before. If I have a jar, it turns into a covetous situation. Which, to be quite honest, is the reason that I only buy a jar about twice a year or so (unless I have a specific purpose for it, that is). I like it as dessert. All by itself. On a spoon. The biggest one I can find. I figure after a healthy meal, when I'm feeling like something chocolaty, digging in and coming away with a heaping spoonful...just one...isn't so bad. Because really, how could something so good be bad!? Fortunately for me, I am the only one in the house who likes it. I don't try to convince them otherwise. I know one day they'll see the error of their ways. I am happy to let them discover it in their own time. So, for the rare times when I lend my jar to a recipe, it had better be a good one. This. Is a good one. Peanut Butter cookies are one of my top 5. I figured they could only benefit from a handsome swirl of Nutella. They did. Beautifully peanut-buttery and chewy, yet crumbly and Nutella-enhanced. Anyone? Even the Nutella-naysayers that surround me loved them. Figures. Happy World Nutella Day! Cream butter, peanut butter, and both sugars together until light and fluffy. Beat in egg and vanilla. Add flour, baking soda, and salt and beat until just combined. Plog Nutella on top of the dough in small spoonfuls, then swirl through gently using a thin butter knife. Chill dough for at least 15 minutes in the refrigerator. Grab a piece of cookie dough that is about the size of a golfball (roughly a scant Tablespoon). Roll as best as you can into a ball. The dough is slightly crumbly, though...so it may help to put a bit of cold water on your hands and press together. Place balls on a parchment/silpat lined sheet tray. Using a fork (dip in water between cookies to keep it from sticking), make a criss-cross pattern on the top of each dough ball, pressing gently. Bake until edges are slightly golden, ~9-12 minutes. Let cookies sit on sheet for 2 minutes after removing from oven before transferring to a wire rack to finish cooling. 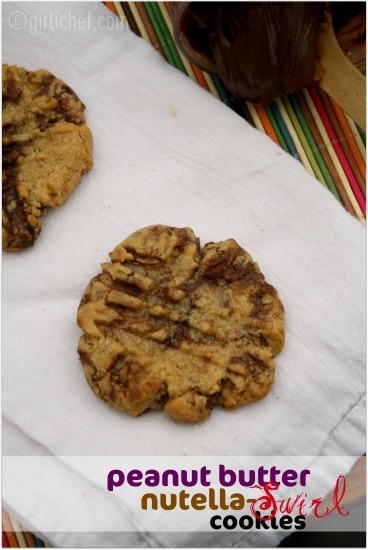 These cookies are a bit sandy and crumbly, yet perfectly moist and chewy in the center. Peanut buttery with hints of Nutella in each bite. Enjoy warm with a cold glass of milk. Wow, is it the Nutella day again, already? I must be enjoying it too much through out the year so, 1 year pass by faster than I know! I love Nutella. What a nice reason to indulge more. :) Happy Sunday! Who doesn't love Nutella! Those cookies look divine! I eat peanut butter with nutella all the time. Such a good combo. This looks delicious. I love that you can see the swirl of nutella through these. I am planning on putting some nutella inside cupcakes today, but I might make these too. My wee boy loves peanut butter & nutella sandwiches, so he would love these. I bought a large jar to make my recipe and the rest was eaten with a spoon! These cookies would have been delicious if I had any left. Happy Nutella Day. The swirly looks so cool! I agree - hard to not just eat the whole thing out of the jar! What a happy day! What a great recipe, I'm a weirdo because I'm not a big fan of nutella but I'llmake this recipe for sure, I know a couple of people who will eat them without any compassion hahahaha. What a wonderful, wonderful idea! My husband and son adore Nutella, and they will love these. 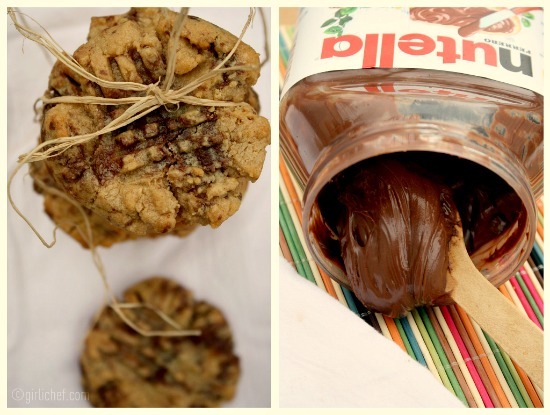 I know I will too :) Thank you for sharing these delicious cookies (and World Nutella Day!) with the Gallery of Favorites. Please send a dozen this way soon, Heather! They look and sound delicious!!! Anything with Nutella is awesome in my book! Those are so pretty with the bit of dark from the chocolate in there. By the spoonful is the way I like Nutella as well. Unfortunately, I can't trust myself to stop at one spoon. So, it's permanently banned from my house. Those cookies look great, I think every day would have to be Nutella Day after having one of those cookies. I'm with you on the Nutella thing - I cannot buy a jar to cook with unless I'm cooking with it that day. Otherwise it's eaten with a spoon. Same with Biscoff! Love these cookies, beautiful! Well now you've gone and combined TWO of my favorite addictions in one cookie. Dangerous at best. I think this must be the perfect pairing. ;-) I am drooling. I know my daughter would LOVE to bake these for ME!! these would have been perfect for sunday's game!! bookmarked! your killing me girl, lol!! Oh no, how did I miss World Nutella Day?!? Don't think I've ever had it in a cookie but I am a huge fan of the stuff, will have to try these soon! 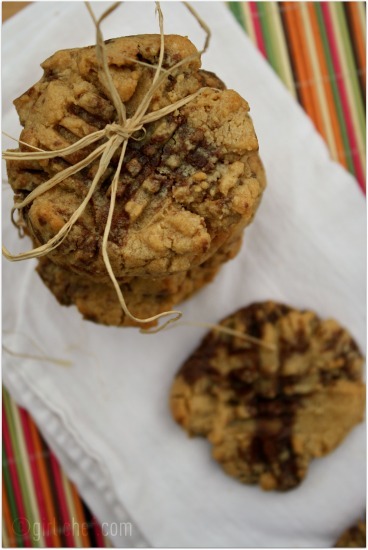 Love how pretty these cookies look with the chocolate swirl! So delicious looking!